The Strokes' debut album Is This It has been named the best album of the decade by music magazine NME. The Libertines' 2002 debut Up the Bracket was voted second in the list of the top 50 albums, with Primal Scream's XTRMNTR coming in third. Bands such as Radiohead and Arctic Monkeys, plus record producers and label bosses were among those who cast their votes. Guitar-led rock acts dominated the list with nine out of the top 10 places. Is This It, with its lo-fi scratchy guitars and hits like Last Nite and Someday, was one of the most acclaimed albums of the year when it was released in 2001. Its infamous cover shows a hand in a black vinyl glove resting on a woman's naked thigh - thought by many to be a reference to Spinal Tap's fictitious Smell The Glove album. The Strokes' frontman Julian Casablancas said of his band's top position: "It's totally crazy! I thought it was great when I heard. "But does it mean it's a good musical decade or a bad musical decade? I don't know, I'm such a bad judge of my own stuff. "Recording the album was fun. It was stressing, it was exciting. I don't want to get carried away, but I'm pretty damn psyched with myself," he added. 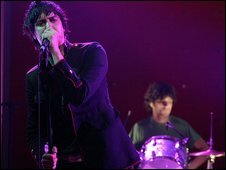 The year 2002 is the most well-represented in the list with eight albums, including releases by Interpol, The Streets and Queens of the Stone Age. NME Editor Krissi Murison said: "This is the definitive word on the greatest albums of the 00s - as voted for by everyone who helped make music brilliant this decade." The full top 50 can be seen in this week's issue of the magazine.